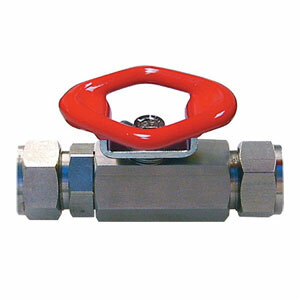 Tube Compression Ball Valves 1/4 to 1"
The BV70 series has been discontinued. Please contact our Flow Engineering department. The BV70 Series tube compression valves offer an excellent alternative to high pressure valves for those applications where a pressure rating of 1,000 psi or less is required. The BV70 Series is offered in both brass and 316 stainless steel bar stock construction in sizes of 1/4 to 1" O.D. tube and comes equipped standard with reinforced PTFE seats and stem seal and stainless steel balls and stems. The compression joint uses the proven, twin ferrule design to ensure positive two point sealing between the tube and fitting. The BV70 Series valve is carefully cleaned, assembled without lubricants, and then thoroughly tested to ensure leak-tight performance. This process minimizes contamination of the media and helps to protect delicate system instrumentation. As with all valve products the BV70 Series utilizes our superior self-compensating stem seal design. This proven design automatically compensates for wear as well as thermal expansion and contraction resulting in a leak tight, maintenance free, service life. The BV70 Series is offered with oval, manual operators but can be easily automated by directly mounting the pneumatic or electric actuators. (see BVP70, BVPS70 and BVE70 Series. Both compact automation packages feature rigid, precise mounting systems to reduce wear and ensure long trouble-free service.